Not only does garlic keep the vampires at bay but it also makes everything taste better. Fresh garlic from potted garlic plants, keeps the nearby bulbs crisper and more pungent than any from the grocery. Growing garlic in containers takes some planning and the right type of container. Read on for some tips on how to grow garlic in a container and capture the head bite of fresh bulbs in your home recipes. Garlic is in the Allium family, which includes onions and shallots. The bulbs are the most powerful flavor on the plants, but the greens are also eaten. It is these heady bulbs which are the basis for planting. Each is planted 2 to 3 inches deep and must also have room for the roots to grow. This should be a consideration when choosing your container. Garlic planted in fall is ready for harvest by June. Growing produce in pots near the kitchen is a space-saving trick, but also allows the cook in the family easy access to the freshest ingredients possible. Growing garlic in containers provides that just-picked flavor for the strongest bulbs ever. You need one that is at least 6 inches deep and has excellent drainage. The container also needs to be big enough to leave 6 inches of space between cloves. Other things to consider are evaporation rate and heat conductivity. Terra cotta pots evaporate more quickly and will need to be watered more often than glazed pots. If you don’t care about appearance, you can even use a 5-gallon bucket with holes punched into the bottom. The proper soil medium is important for garlic planting in pots. It can’t retain too much moisture nor be too dry, and should have plenty of organic nutrients available for the bulbs. 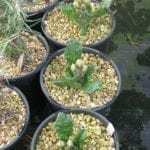 A good mix of peat, perlite or vermiculite, potting mix or compost and a little bit of builder’s sand will give you the drainage, moisture retention and nutrients necessary for growing garlic in containers. Container gardening for garlic can also include some early harvest cool vegetables, such as lettuce, which will be harvested before winter’s chill in most cases. Lettuces planted over un-sprouted cloves will minimize weeds and keep the soil broken up with their roots. Once you have your planting medium and container, fill the receptacle halfway full of the soil mix. Add a slow release granular balanced plant food, such as a 10-10-10, and mix into the soil. Insert the bulbs with the pointed side up and then back fill with more soil, pressing around each clove. If moisture is minimal, water the soil until it is evenly damp. Plant a short-term crop on top or simply cover the container with organic mulch. In spring the shoots will come up and eventually turn into scapes. Harvest these for stir fry or just to eat raw. By late June, your garlic is ready to dig up and cure. 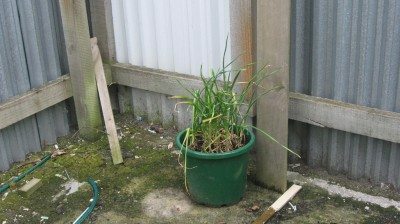 Container gardening for garlic is that easy and very rewarding. Try it as an annual part of your fall planting for delicious ready-to-grab flavor and zing in all your food.